The future of integrating lenses into Infrastructure Documentation and Workflows. 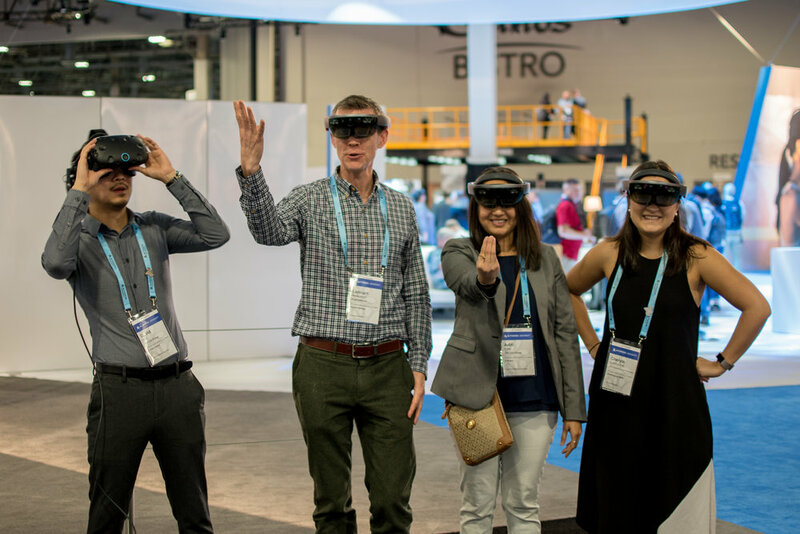 LiRo VDC/O was honored to receive an invitation from Autodesk to showcase our progressive work in the infrastructure sector at their Future of Making Things (FOMT) exhibit, a centerpiece to the wider Autodesk University convention. FOMT represented 39 companies and projects who are considered innovators and early adopters of technology, not just in AEC space, but more generally, our surrounding environment – from coral reefs to prosthetic limbs. LiRo VDC/O is researching, developing and incorporating into its workflows cutting-edge tools such as reality capture, mixed reality (MR), virtual reality (VR), game-engine visualizations, and automation tools. The way we view and interact with project documentation has remained largely the same for decades. As we move from traditional analog processes to digital data-driven ones, how we utilize VR and MR to analyze, visualize, and communicate project information will pivot dramatically. Jumping ahead of the curve, we showed how and why this might happen. Owners, designers, and operators will all benefit from the interaction of new technology. Applications include immersive experience simulations of traffic lane updates, using mixed reality for facility inspection and maintenance training, and utilizing BIM as a 3D 'digital twin' of the as-built facility. Lennart Andersson, VDC/O director, presented a TED-style talk about the LiRo exhibit at the Autodesk Theater along with several others taking part in FOMT. As part of the presentation, Lennart gave his thoughts on the future of technology as it pertains to urban infrastructure and asset management. LiRo received the opportunity to take part after Aditi Patel, our VDCO/O Technology Manager, introduced some of LiRo's BIM initiativies at an automation workshop in Boston earlier this year. In addition to BIM automation, she has taken the lead on creating applications in mixed reality for the Microsfot HoloLens. David Wu, our Model Manager, developed an application in virtual reality. Both were extremely well received. The efforts of the team were in keeping with Autodesk's message for the evolving AECO workforce, and the drive to be "upskilled." Aditi and David were invited to partake on a panel to convey their experience teaching themselves how to code and create applications for virtual and mixed reality. It was an exhausting three days on the floor, but amazing to be able to share our Bridges and Tunnels work with people from all over the world, and the immense capabilities of new technology. A recording taken through the Microsoft Hololens of LiRo's mixed reality application. It conveys how a bridge maintenance person of the future might interact with pertinent machinery documentation, by calling up a 3D hologram and relevant details. A recording of the LiRo Virtual Reality application, using the HTC Vive. The viewer starts off in a construction trailer, where they can see a 3D model of the entire bridge. They are then ported into an interactive driving simulation of new design changes to a roadway leading up to the bridge. This illustrates exciting new ways to how stakeholders can come to understand a project.